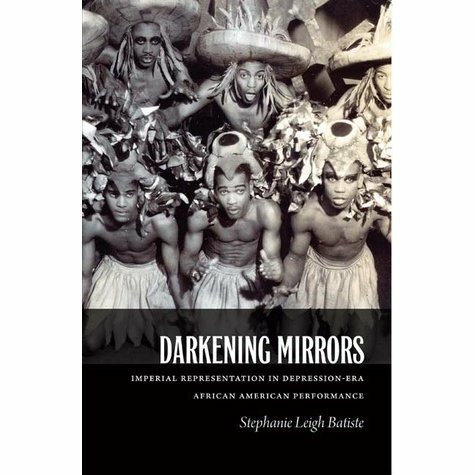 In Darkening Mirrors, Stephanie Leigh Batiste examines how African Americans participated in U.S. cultural imperialism in Depression-era stage and screen performances. A population treated as second-class citizens at home imagined themselves as empowered, modern U.S. citizens and transnational actors in plays, operas, ballets, and films. Many of these productions, such as the 1938 hits Haiti and The “Swing” Mikado recruited large casts of unknown performers, involving the black community not only as spectators but also as participants. Performances of exoticism, orientalism, and primitivism are inevitably linked to issues of embodiment, including how bodies signify blackness as a cultural, racial, and global category. Whether enacting U.S. imperialism in westerns, dramas, dances, songs, jokes, or comedy sketches, African Americans maintained a national identity that registered a diasporic empowerment and resistance on the global stage. Boldly addressing the contradictions in these performances, Batiste challenges the simplistic notion that the oppressed cannot identify with oppressive modes of power and enact themselves as empowered subjects. Darkening Mirrors adds nuance and depth to the history of African American subject formation and stage and screen performance. Stephanie Leigh Batiste is a performance artist and Associate Professor of English and Black Studies at the University of California, Santa Barbara. The Hemispheric South/s Research Initiative is excited to announce its first featured book of the 2016-17 academic year: Southern Accent: Seeking the American South in Contemporary Art, a catalog edited by Miranda Lash and Trevor Schoonmaker. (Durham, NC: Duke University Press, 2016). 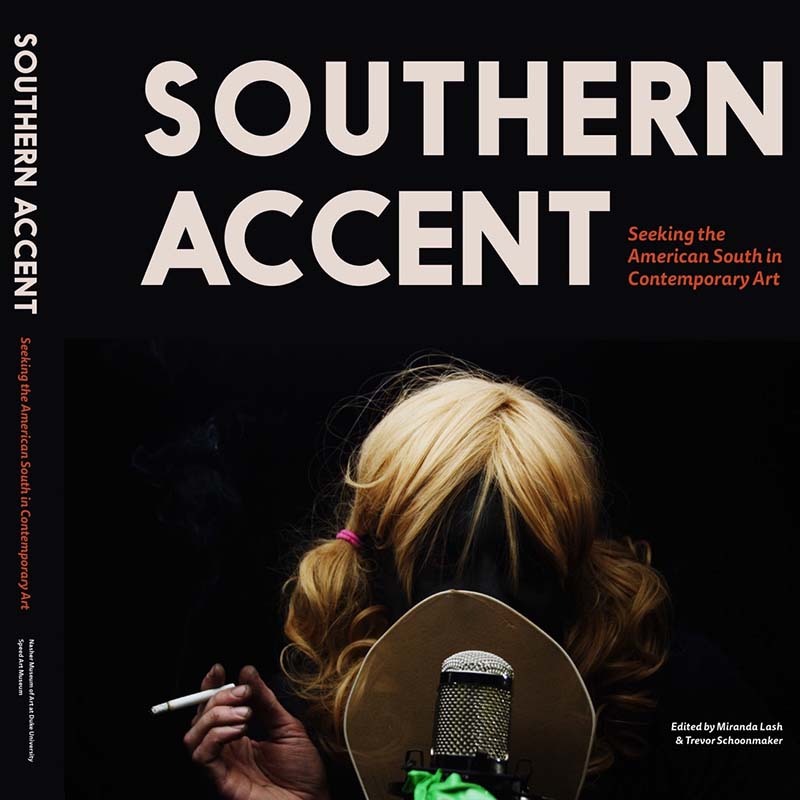 From the publisher: Featuring the work of sixty artists and including 300 illustrations, the catalog Southern Accent accompanies a major contemporary art exhibition that questions and explores the complex and contested space of the American South. This unprecedented exhibition investigates the many realities, fantasies, and myths of the South that have long captured the public’s imagination, while presenting a wide range of perspectives that create a composite portrait of southern identity through contemporary art. It looks at the South as an open-ended question and concept in itself by encompassing a broad spectrum of media and approaches, demonstrating that southernness is more of a shared sensibility than any one definable culture or style. While the exhibition includes artwork from the 1950s to the present, it primarily focuses on the past thirty-five years. With numerous contributions by artists, scholars, musicians, and poets, a music-listening library, and a timeline of scholarship on southern art, this catalog redefines the way we look at the South in contemporary art. Southern Accent will be on display at the Nasher Museum of Art at Duke University from September 1, 2016 to January 8, 2017 and at the Speed Art Museum in Louisville, Kentucky, from April 29, 2017, to August 20, 2017. Miranda Lash is Curator of Contemporary Art at the Speed Art Museum in Louisville, Kentucky. She previously served as Curator of Modern and Contemporary Art at the New Orleans Museum of Art and is editor of Mel Chin: Rematch, Dario Robleto: The Prelives of the Blues, Sydney and Walda Besthoff Sculpture Garden, and Skylar Fein: Youth Manifesto. Trevor Schoonmaker is Chief Curator and Patsy R. and Raymond D. Nasher Curator of Contemporary Art at the Nasher Museum of Art at Duke University in Durham, North Carolina, where he has curated traveling exhibitions such asWangechi Mutu: A Fantastic Journey and The Record: Contemporary Art and Vinyl. He is the Artistic Director of the Prospect New Orleans Triennial, 2017–2018, and is the editor of several books, including Fela: From West Africa to West Broadway. 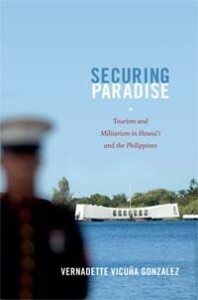 The Hemispheric South/s Research Initiative is excited to announce its first featured book of 2015: a volume by Vernadette Vicuna Gonzalez : Securing Paradise: Tourism and Militarism in Hawai`i and the Philippines Performance Art of the Americas (Durham, NC: Duke University Press, 2013). From the publisher: Vernadette Vicuña Gonzalez shows how tourism and militarism have functioned together in Hawai`i and the Philippines, jointly empowering the United States to assert its geostrategic and economic interests in the Pacific. She does so by interpreting fiction, closely examining colonial and military construction projects, and delving into present-day tourist practices, spaces, and narratives. For instance, in both Hawai`i and the Philippines, U.S. military modes of mobility, control, and surveillance enable scenic tourist byways. Past and present U.S. military posts, such as the Clark and Subic Bases and the Pearl Harbor complex, have been reincarnated as destinations for tourists interested in World War II. The history of the U.S. military is foundational to tourist itineraries and imaginations in such sites. At the same time, U.S. military dominance is reinforced by the logics and practices of mobility and consumption underlying modern tourism. Working in tandem, militarism and tourism produce gendered structures of feeling and formations of knowledge. These become routinized into everyday life in Hawai`i and the Philippines, inculcating U.S. imperialism in the Pacific. Vernadette Vicuna Gonzalez is Associate Professor of American Studies at the University of Hawai‘i at Mānoa. Our second featured book of 2015 is Haunting Capital: Memory, Text, and the Diasporic Body (Lebanon, NH: Dartmouth College Press, 2005) by Hershini Bhana Young. From the publisher: Haunting Capital departs from traditional trauma studies, which stress individual wounding and psychotherapeutic models. Instead, Young explores the notion of injury as a collective wounding, resulting from the trauma of capitalistic regimes such as slavery and colonialism. She also introduces the idea of the ghost to her discussion of collective injury, where it functions not only on theoretical and metaphorical levels, but also by invoking African cosmologies in which ghosts are ancestral beings with a real spiritual presence. More specifically, Young insists on the contemporary reality of African nations and eschews the presentation of Africa as a vague, undifferentiated point of origin that characterizes many other studies of the African diaspora. Her reading of African contemporary novels by women, alongside African American and Caribbean novels, works to show the African diaspora as haunted by similar, though different, issues of gendered and racialized violence. Hershini Bhana Young is Associate Professor of English at the University at Buffalo, the State University of New York.